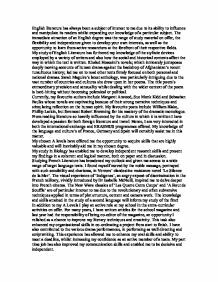 English literature personal statement - English literature has always been a subject of interest to me due to its ability to influence and manipulate its readers whilst expanding our knowledge of a particular subject. 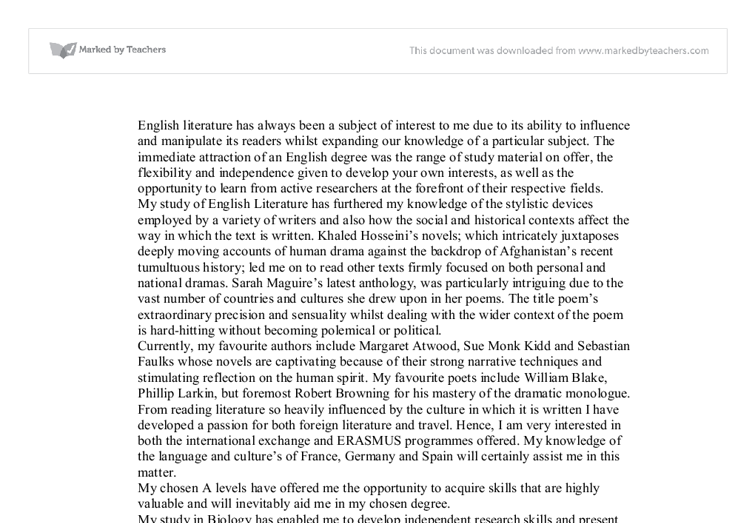 English literature has always been a subject of interest to me due to its ability to influence and manipulate its readers whilst expanding our knowledge of a particular subject. The immediate attraction of an English degree was the range of study material on offer, the flexibility and independence given to develop your own interests, as well as the opportunity to learn from active researchers at the forefront of their respective fields. My study of English Literature has furthered my knowledge of the stylistic devices employed by a variety of writers and also how the social and historical contexts affect the way in which the text is written. Khaled Hosseini's novels; which intricately juxtaposes deeply moving accounts of human drama against the backdrop of Afghanistan's recent tumultuous history; led me on to read other texts firmly focused on both personal and national dramas. ...read more. Hence, I am very interested in both the international exchange and ERASMUS programmes offered. My knowledge of the language and culture's of France, Germany and Spain will certainly assist me in this matter. My chosen A levels have offered me the opportunity to acquire skills that are highly valuable and will inevitably aid me in my chosen degree. My study in Biology has enabled me to develop independent research skills and present my findings in a coherent and logical manner, both on paper and in discussion. Studying French Literature has broadened my outlook and given me access to a wide range of target language texts. I found myself moved by the noble message, portrayed with such sensibility and charisma, in Vercors' clandestine resistance novel 'Le Silence de la Mer'. ...read more. This task also enhanced my organisational skills in co-ordinating a project from start to finish. I have also contributed to the various drama performances, in performing as well directing and scriptwriting. This experience has allowed me to enhance my oral skills and ability to meet a deadline, whilst increasing my confidence as an active member of a team. My part time job has also improved my communication skills and enabled me to be decisive and independent. My positions as Deputy Head Girl, Head of School Council, Head of House and keen sports player have helped me to develop my leadership and inter-personal skills. The academic success and enjoyment I have had in studying English has given me the confidence to approach it at degree level with readiness and determination. ?? ?? ?? ?? ...read more. Many students like me would share with other class members the clarity of the topic we were taught during the session that evening. I felt sick with worry. I imagined my name not being called out as, 4th, 5th or 6th, meaning I wasn't on the podium. The simple thought was abruptly erased, as vague sounds suggested movement. But not the usual slaps on water that suggest food. My slim eyes widened and everything seemed to slow down. I crawled backwards but the forte noises advanced. Danger. Therefore, when the child points to a motorcycle and tell the caregiver it is a car, the caregiver can provide the appropriate linguistic input by saying that it is a motorcycle and go on telling him about the number of wheels it has or its colour. Clearly the harsh consonants of 'b', 's' and 'r' reinforce the clarity of the old woman's anger. Through this, the reader is endowed with the toll of damage and depression that has encapsulated the old woman. The tone is then reworked into a sequence of happy, nostalgic memories. for the license fee, whereas the "pay-per view" option is less obtrusive allowing people to make up their own minds. The exploration of television brings to light that of moral behaviour. A large proportion of television audiences consist of teenagers, these are extremely susceptible to what is seen as their moral values are currently in development (Banerjee, 2005). But, the Hispanic immigrants have been much more reluctant to change, leading to server economic problems. "The income gap between the United States and Mexico is the largest between any two contiguous countries in the world" (Kennedy). The average Hispanic doesn't have a high school diploma. This theory can again be supported by a study completed by the University of Bristol in 2008. They found that all children no matter what country they are born in can make the same phonetic noises as a very young baby, however as they grow older they lose the sounds that their culture does not use.